The soft inside of this hat with no harsh seams helps to reduce scalp irritation while the softness of the bamboo fabric makes it ideal for sleeping in. The soft, comfortable turban is available in a large colour range and is one of our most popular styles for both night and day. The simplicity of this hat makes it multi-purpose for day wear as it lends itself very well to providing a base for adding scarves or brooches to dress it up for day or evening wear, while the softness of the fabric makes it a nice, easy hat to wear while sleeping. The bamboo fabric in this hat makes it extra absorbent and highly breathable and has antiperspirant properties. 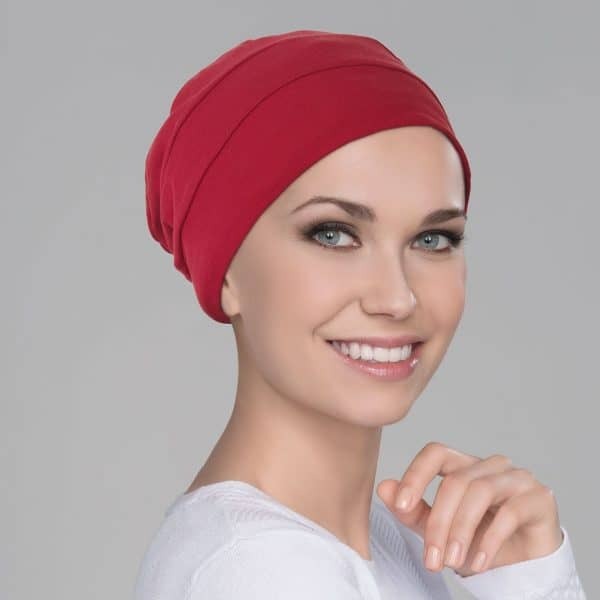 This hat provides full coverage of the head and is not tight on the head instead giving fullness for the impression of hair underneath.